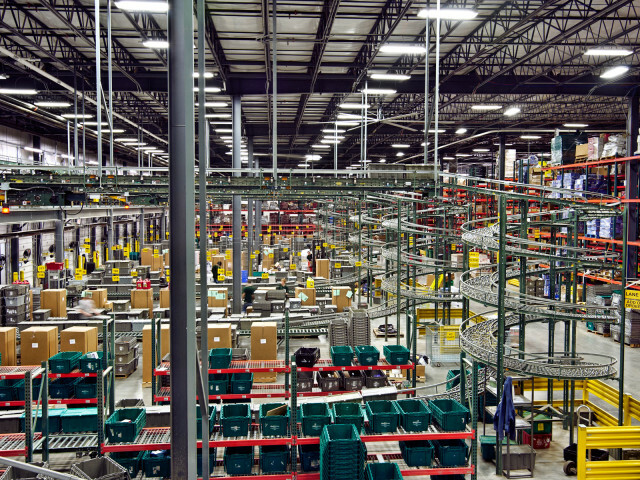 Mega-sized warehouses migrate to K.C. Building speculative distribution centers is nothing new in Kansas City. But building distribution centers exceeding 100,000 square feet is an altogether new phenomenon in Kansas City. Prior to 2004, an overriding majority of the distribution centers in Kansas City were between 50,000 to 75,000 square feet, says Mark Sonnenberg, senior vice president and director of industrial sales and leasing for Colliers Turley Martin Tucker. Today, the average distribution center in Kansas City necessitates at least a 250,000 square feet structure. s Kansas City’s transportation and shipping sector becomes more of a regional and national player, with the emergence of SmartPort, an inland customs clearinghouse and a hearty transportation infrastructure, mega-sized warehouses are being built. Retailers and manufacturers need big spaces to store and ship products. This has led to a new development in the city’s commercial real estate sector—the speculative warehouse. Investors are building warehouses near airports and rail lines without a tenant or a buyer in anticipation that if you build it, they will eventually come. Recently, Kessinger-Hunter announced plans to build a 600,000 square-foot speculative distribution center in South Johnson County. The warehouse will be situated next to the new 400,000 square-foot Pacific Sunwear distribution center in Olathe. Although Jensen likes to think of Kessinger-Hunter’s actions as trendsetting, Sonnenberg is assured similar deals are in motion and other developers are “waiting to get their debts in tow” before making the pronouncement. Not that the competition isn’t healthy for Kansas City. he reasons for the influx of monstrous bulk warehouses are many. For one, distribution has become more consolidated, with more and more manufacturers recognizing the efficiency in storing goods in larger warehouses. “Manufacturers are realizing that it’s a lot more cost-effective having one massive warehouse within striking distance of a large fraction of your consumer base than having four or five smaller distribution centers sprinkled throughout the country,” Jensen says. Jensen says that the 600,000 square-foot warehouse Kessinger-Hunter plans to build by spring of next year will be able to reach 80 percent of the population within a two-day period. When you order a shirt from Land’s End, you may not expect it to arrive at your doorstep the next day, but if it arrives any later than a couple days, you’re not going to be very happy. According to Jensen, manufacturers are simply adapting to this “gimme now” mentality. Sonnenberg says that right now the south is experiencing an unprecedented population boom, particularly in Texas, Georgia, Florida and Arizona. And with Kansas City Southern, one of the nation’s premier north-south railroad companies, partnering with Chicago-based Point Properties to develop an international freight gateway in the South Kansas City corridor that could result in seven million square feet of distribution space, the city will be in a prime position to capitalize in the southern U.S., Sonnenberg said. “Kansas City’s rich supply of well-organized rail and highway networks are the apple in the eye of many a manufacturer,” Sonnenberg says. As Jensen says, Kansas City’s notoriety as a rail hub dates well back to the mid-19th century. espite Kansas City’s rapid growth over the last decade, Jensen foresees the city remaining slow and steady for years to come: an important element in the realm of real estate. “In other words, Kansas City may not have the velocity you find in other cities, but you don’t have the down time either,” Jensen says. “Certainly, the real estate values on prime pieces of property within a stone’s throw of such transportation networks as railways, highways and airport space will experience a steady increase in value,” Jensen says. Business aside, Kansas City’s just a terrific place to call home, Jensen says. The potential of the Kansas City Southern international freight gateway, combined with Burlington Northern Santa Fe railroad’s commitment to build a $200 million intermodal facility in Gardner, Kansas, which will create 12 million square feet of additional distribution space, still won’t propel Kansas City beyond second-tier status in the shipping and transportation industry, says Sonnenberg. In the next several years, however, Sonnenberg projects Kansas City standing toe-to-toe with some of the stronger second-tier markets including St. Louis, Indianapolis and Memphis. Among the major areas conducive to growth in terms of large-scale distribution warehouses is MCI, Sonnenberg says. The 640-acre property is responsible for more air cargo than any airport in the region including Kansas, Iowa, Nebraska and Oklahoma. MCI and CB Richard Ellis Group plan to build a 300,000 square-foot speculative distribution center. lthough Sonnenberg envisions MCI to be a growing quadrant in Kansas City over the next five to ten years, he is skeptical how developers will take to the land-lease situation currently in place. Through land-lease, MCI is able to maintain ownership of the land beneath the prospective building. One of the negatives associated with a land-lease agreement is the possibility that the property will be harder to finance and therefore harder to sell. Jensen also has his reservations about MCI’s industrial development potential. In late June, the City of Kansas City, Missouri, the Port Authority of Kansas City, and CenterPoint Properties, an intermodal developer, closed a series of redevelopment and sale agreements on 1,400 acres at what was once the Richards-Gebaur Air Force base. The area will be converted into an intermodal trucking and rail port and will compliment the BNSF intermodal facility in Gardner, Kan.
longtime area of relevance both in residential and industrial real estate development is Johnson County. Neither Sonnenberg nor Jensen anticipates this changing in the future. “Johnson County is about as proven as it gets,” says Sonnenberg, whose real estate firm will build a 450,000 square-foot distribution center for Kimberly-Clark at the New Century Air Center in Olathe – a mere stone’s throw from where Kessinger-Hunter will build their mammoth speculative distribution center. Jensen says that as soon as his firm can digest the 600,000 speculative warehouse in Olathe, there will be ample room left for seconds. “Once we get this one up and running, we fully intend on doing another spec warehouse of similar if not larger proportions,” Jensen says. All in all, Sonnenberg says that between 700 and 1000 acres are under contract in the Kansas City area at present. Besides about 100 acres being under contract at MCI, Sonnenberg says that another 200 acres are in play in southern Johnson County and a whopping 335 acres are up for grabs in Riverside.